Plastic optical fibers offer a more efficient method of data transmission in telecommunications. While glass optical fibers allow very high data rates to be transmitted, they are expensive and difficult to work with. Twisted pair copper cabling, on the other hand, is cheap and easy to work with, but slow. Plastic optical fibers represent an intermediate solution, providing reasonable data rates at a low cost. To promote their wider usage, however, the data rates must first be improved. 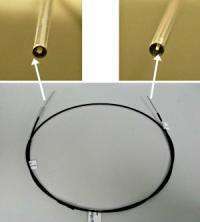 Pinjala Damaruganath and co-workers at the A*STAR Institute of Microelectronics and the Nanyang Technological University have now discovered a way to increase the data rates of plastic optical fibers. A plastic fiber typically supports thousands of different optical modes, and each individual optical mode has a particular frequency and speed at which data propagate. Due to the differences in propagation speed, the data signal gets increasingly distorted as it travels down the fiber. If adjacent digital pulses overlap, the receiver might not be able to decode the data. This phenomenon, known as modal dispersion, is the principal factor limiting the data rates attainable in plastic optical fibers. Restricted mode launching is one widely used solution to overcome modal dispersion. In this method, a light signal is launched into one mode or a small number of modes in the fiber. This is usually coupled with a mode filter at the receiver end of the fiber. Standard realizations of mode launching and filtering involve splicing or aligning a single-mode fiber to each end of a large-diameter fiber, but the task is time-consuming and the resulting system can be bulky. Using a mathematical model of transmission along their fiber system, Damaruganath and co-workers designed a simple and compact tapered structure that can be attached to the two ends of a plastic optical fiber (see image). On the input end, the taper eliminates higher-order modes, and on the output end, its diameter matches the fiber at one end, and the size of the detector at the other end. This increases output coupling efficiency. In both cases, the slowly changing (or adiabatic) taper diameter suppresses different modes from interacting with each other. Measurements of the resulting optical system show that it can achieve a transmission rate of 2.5 gigabits per secondaround 16 times more than previously demonstrated data rates with similar-sized plastic fibers. The tapers are also mechanically robust and compatible with standard receiver connectors. The work is expected to hasten the adoption of plastic optical fibers into short-range telecommunication networks. More information: Chandrappan, J., et al. A pluggable large core step index plastic optical fiber with built-in mode conditioners for gigabit ultra short reach networks. IEEE Transactions on Advanced Packaging 33, 868875 (2010).